I’ll be attending the upcoming Bridal Show on June 12th at the King Center. The theme for this show is Baubles & Bling. So in appreciation for all things Bling – here is a Fabulous Finds homage to the sparkle and glam, the fun and fashion… Hope to see you at the show, be sure to stop by my booth and say hello!!! 1. 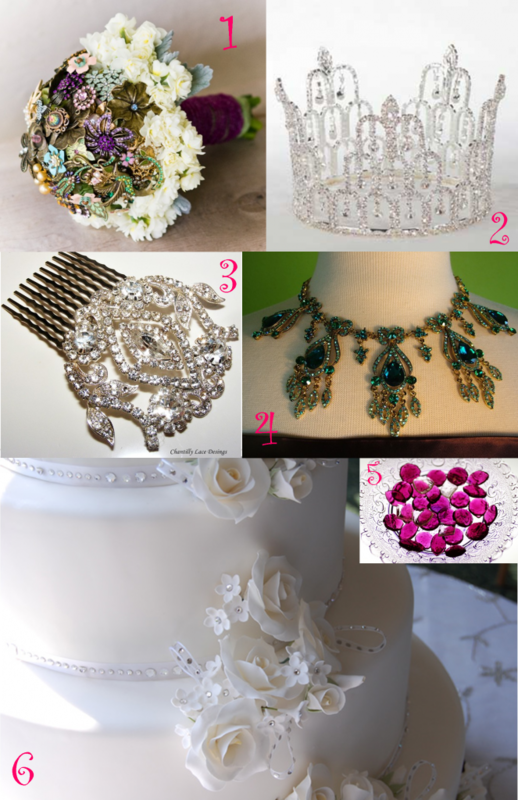 Flowers can have bling too – but in this instance, the entire bouquet is your bling! Check it out here. Don’t want to make it, but love it? You can buy one here. 2. Cakes are a great way to bling it up – Add a crown of jewels! I just adore this piece, you can get it here. 3. Don’t want a tiara but still want some sparkle? This comb is the perfect compromise! Get it here. 4. Not all bling has to be modern or inspired by diamonds! Check out this fantastic Victorian inspired necklace here. 5. Candy gems! Who can resist these?! They are the perfect for favors, to add to a candy bar, or to even spread around the tables as added, edible, decor! See how to make these here. You can also find another recipe here. 6. Not enough cake bling? This gorgeous piece of art was made by Cookie Creatives by Jennifer in Massachusetts. See the blog entry on this masterpiece here. See some amazing crystal decor ideas at http://www.etherealdecor.com as well – amazing!! !